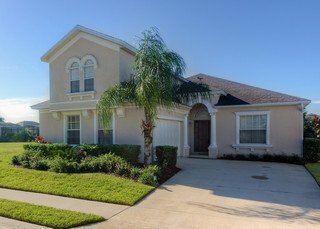 Florida Palms is a 5* high class brand new home that was completed in December 2008, the attention to detail making it one of the best value for money villas in the Orlando area. A south facing pool ensures maximum exposure to the Florida sunshine and a highly desirable base for the most discerning of holidaymakers. The villa consists of 4 bedrooms and 4 bathrooms (3 En-suites) with a maximum occupancy of 8 (+ infants) and boasts a private pool area with spa and waterfall, plus a pool shower complete with toilet facilities. It has modern and luxurious decor in all rooms, leather seating, granite worktops, marble sinks, tiled flooring throughout the living areas and fully carpeted bedrooms for maximum comfort. 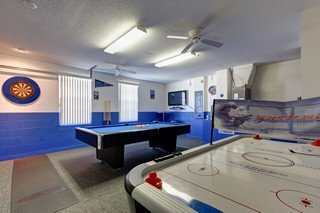 With a fully furnished games room, this home has pretty much everything you need for a truly wonderful vacation. The pool area consists of a covered lanai area with patio table that seats 6 comfortably, and has 4 reclining seats (along with 2 foot stools and 2 side tables) which will suit the most ardent of sun worshippers. There are also a variety of inflatables which can be used in or around the pool, and should keep most youngsters amused for hours. 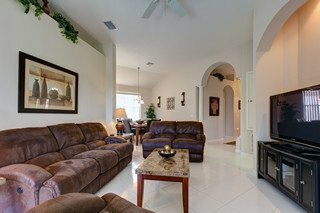 The villa is located on the prestigious new, gated community of Calabay Parc at Tower Lake, which has many facilities including clubhouse, fishing pier, picnic area and boating ramp for a range of water sports. Satellite HD TV with Over 400 channels including UK channels, Movies, Premiership, Champions League & UEFA games. Please visit our website for further details and a 360 tour.